While I love to color images for cards, every once in a while it's fun to just do some fancy paper piecing techniques. This technique is one called a 'Herringbone' pattern. You can check out by blog for more details. 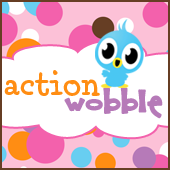 I used an Action Wobble on the sentiment. While I usually try to snap a picture of the action wobble in action (pun intended) here's a picture of me moving the wobble piece before letting it go.